The ovaries are active organs, which naturally develop cysts during each menstrual cycle. 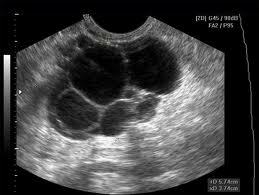 Small ovarian cysts (follicles) are normal especially in the lead up to ovulation (egg production) at mid-cycle. The follicle changes in appearance after ovulation and shrinks in size, although it can be seen up until the next period. The sonographer scanning you will assess any cyst to determine whether it is a natural cyst (which will resolve by itself), or a pathological cyst, which might need removal. Luckily most cysts do not need surgery. Transvaginal scans are usually performed and it will take about 20 minutes. You do not need to attend with a full bladder. Size and shape of uterus. Any mass or fluid in the pelvis.